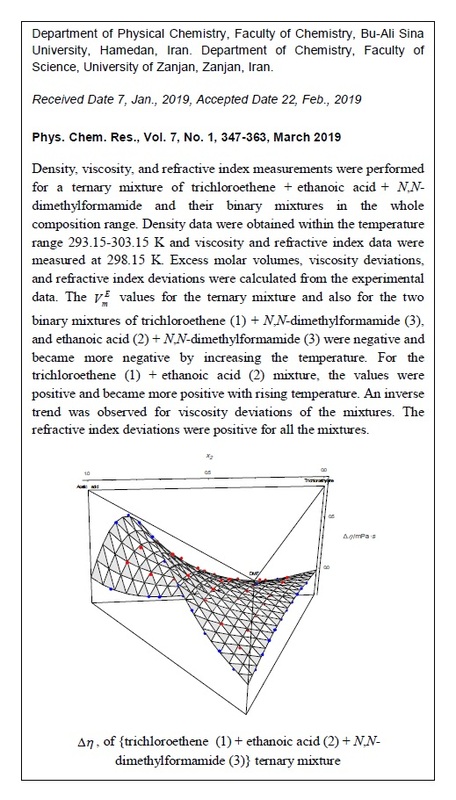 Density, viscosity and refractive index measurements were performed for ternary mixture of trichloroethene + ethanoic acid + N,N-dimethylformamide and their binary mixtures in the whole composition range. Density data were obtained within the temperature range (293.15 to 303.15) K and viscosity and refractive index data were measured at 298.15 K. Excess molar volumes, viscosity deviations and refractive index deviations were calculated from the experimental data. The values for the ternary mixture and also for the two binary mixtures of trichloroethene (1) + N,N-dimethylformamide (3) and ethanoic acid (2) + N,N-dimethylformamide (3) were negative and became more negative by increasing temperature. For the trichloroethene (1) + ethanoic acid (2) mixture, the values were positive and become more positive with rising temperature. An inverse trend was observed for viscosity deviations of the mixtures. The refractive index deviations were positive for all the mixtures. The experimental data for the binary and ternary mixtures were correlated with Redlich–Kister, and Cibulka equations respectively.